Ethan's eyes widened and a broad smile brightened his face as he recognized the work of art that Mummy carefully slid out from the white envelope. "Daddy!" he exlaimed. 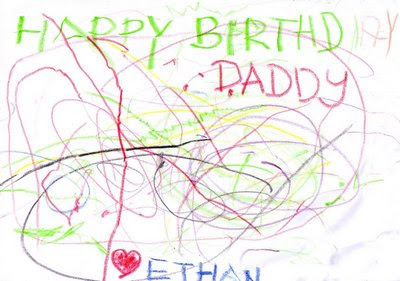 "Ethan, this is the birthday card you made for Daddy yesterday," said Mummy. "Tell Daddy what you drew for him!" "Circles...snakes!" Ethan said as he proudly pointed to various colourful circular squiggles and squiggly lines all over the page. He then proceeded to tell me many things about what he did on the paper which I did not understand, yet understood fully. Another thing I now understand is why parents go gah gah over their toddler's art work... a peculiar phenomena which I never appreciated to know. Ethan's birthday card to daddy will be laminated and displayed!